One of the greatest gifts you can give your family is to provide guidance on the treatments you would – and would not – want to receive if you were unable to speak for yourself. This is called advance care planning. Sharing this information with your family and loved ones will provide them with peace of mind, while also assuring that your wishes will be honored. Advance care planning is for anyone over the age of 18, because at any age a medical crisis or trauma could leave you unable to make your own healthcare decisions. Consider how you wish to be treated if you become critically ill or are seriously injured in an accident and can no longer speak for yourself. Here are some questions to ask yourself and your loved ones. What kinds of life-sustaining medical treatments do I want — or don’t want? What does “quality of life” mean to me? Think about what gives your life meaning. Who we are, what we believe and what we value are shaped by our experiences. Reflecting on your experiences will help you decide what is important to you. The goal of documenting your advance care planning is to allow you to live in a way that’s most important to you. Read this section to find out how. 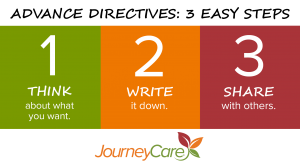 JourneyCare provides a free tool called “Five Wishes” for residents in the Illinois counties served by our agency. Five Wishes is an easy-to-use legal document that is valid in Illinois and most other states, and is written in everyday language that lets adults plan how they want to be cared for in case they become seriously ill.
Five Wishes speaks to a person’s holistic needs: medical, personal, emotional and spiritual. It’s very important to share your wishes with loved ones. If you can no longer speak for yourself, your health agent — who you will identify in your advance directive — will be asked to make these decisions on your behalf. The more guidance you can provide, the easier it will be for your health agent to carry out. Here’s a list of additional legal healthcare documents recognized in Illinois that will allow you to express your healthcare wishes. This medical order is completed with a healthcare practitioner, and is designed to ensure that seriously ill or frail individuals can choose treatments they want or do not want at end of life. This form is not recommended for healthy individuals. A POLST form must be signed by a practitioner if a person would not want paramedics to perform CPR. Without this form, paramedics are required by law to try and keep someone alive. Health Care Power of Attorney (Illinois HCPOA) – This form is similar to the Five Wishes document. It is a legal form that allows you to choose a “health care agent.” The agent is the person you trust to make health care decisions for you if you are unable to do so. It’s very important to select someone who would be willing to follow your wishes, can make decisions in difficult times, and be your advocate. This document allows you to document if you do not want procedures that will delay or prolong your death if you have a terminal illness. This form is limiting in that it is only applicable if you have a terminal condition. If you do have this form, it is encouraged that you also complete a Five Wishes or Illinois HCPOA form identifying a health agent. If you have not completed an advance directive, decisions regarding your health care may be made by someone else (and it may not be the person you would have chosen). Your advance directive will only go into effect when you are no longer able to make decisions yourself. For more information, please contact Rachael Telleen, at rtelleen@journeycare.org or (312) 912-2678. 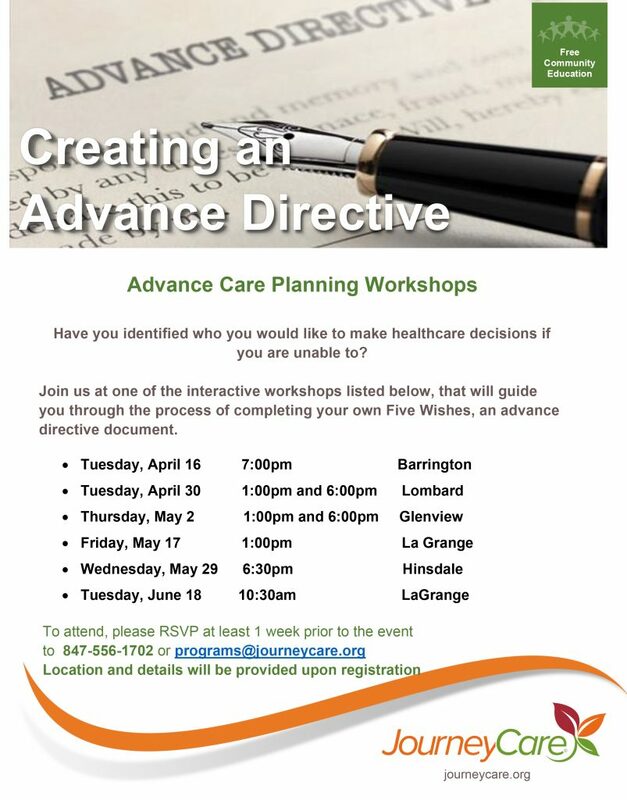 Attend an Advance Care Planning Workshop! 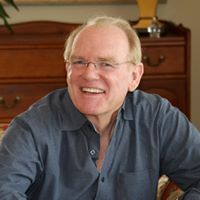 Through personal experience, philanthropist and longtime JourneyCare supporter Bob Lee recognized the importance of advance care planning and became an advocate for community outreach that highlights the importance of education and awareness on advance care planning. Learn more about Bob here. JourneyCare’s Advance Care Planning community initiatives are supported through Bob’s 2001, 2007 and 2012 Rides for 3 Reasons and Jan Gierlach’s 2017 Ride for 3 Reasons. Illinois Department of Public Health – information on advance directives available in Illinois. 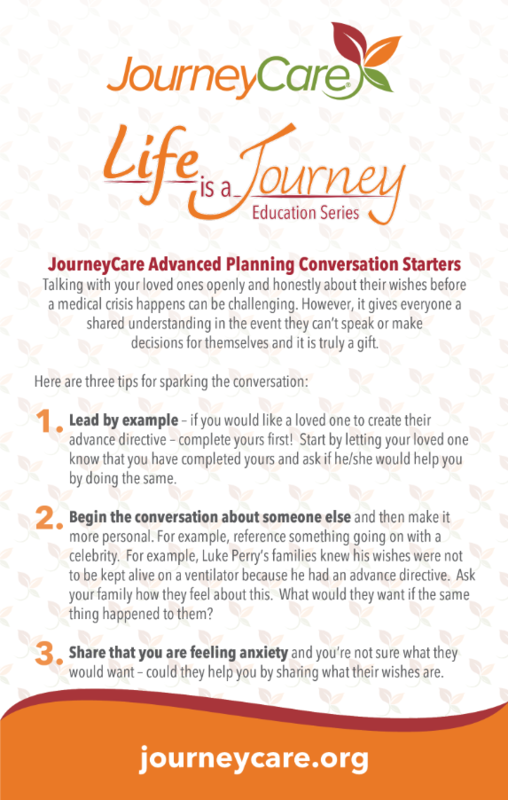 The Conversation Project – dedicated to helping people talk about their wishes for end-of-life care. National Healthcare Decisions Day – a nationwide initiative that aims to help people across the U.S. understand the value of advance healthcare planning.